Five-Two poetry is collected in annual ebooks that account for e-readers' font resizing features in displaying poetic lines. 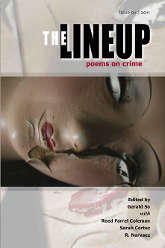 My previous crime poetry publication, The Lineup series, can be printed on demand and is partially available in ebook. 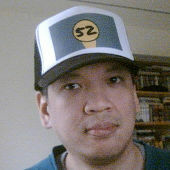 Swag from my Zazzle store, like my hat, also supports The Five-Two. I donate all royalties and referrals from April book and swag sales to the nonprofit Academy of American Poets, supporting poets in all stages of their careers. Collects our sixth year of fifty-two poems. Featuring Kimo Armitage, Michael A. Arnzen, Jeff Bagato, Aja Beech, Peter Braddock, Lida Bushloper, Robert Cooperman, Daniel D'Arezzo, Ted Davis, Darren C. Demaree, C.J. Edwards, Kristina England, Jay Frankston, Peter M. Gordon, Anne Graue, Amy Holman, Tracey Ikerd, J.H. Johns, Tonia Kalouria, Jennifer Lagier, Nathan Lauer, Resa Mestel, Oral Nussbaum, Lisa Olsson, Natisha Parsons, Joseph S. Pete, Karen Petersen, Kent Peterson, Robert Plath, David Rachels, Charles Rammelkamp, Nancy Scott, Karlo Silverio Sevilla, Kelli Simpson, David Spicer, Bonnie Stanard, Sara Tantlinger, Paula Willis, Thom Young, and Angel Zapata. 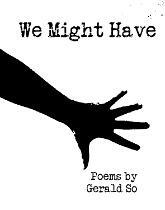 Collects our fifth year of fifty-two poems. Featuring Jonel Abellanosa, Michael A. Arnzen, Bill Baber, Shirley J. Brewer, Craig Faustus Buck, Alan Catlin, Robert Cooperman, Ruth Danon, Abigail George, Peter M. Gordon, John Grey, Bruce Harris, Clarinda Harriss, Chad Haskins, Richard Manly Heiman, Paul Hostovsky, Sharon Israel, Tonia Kalouria, Rosemarie Keenan, April Krassner, Jennifer Lagier, Johnny Longfellow, Alan P. Marcus, Rachel Lynn McGuire, Kurt Nimmo, Simon Perchik, Kenneth Pobo, David S. Pointer, Charles Rammelkamp, Anina Robb, Olivia Romano, Nancy Scott, Sanjeev Sethi, Nancy Smahl-Syrop, David Spicer, Sara Tantlinger, Chuck Von Nordheim, Catherine Wald, Dennis Weiser, and Angel Zapata. Collects our fourth year of fifty-two poems. Featuring Etta Abrahams, Bill Baber, Joe Barnes, Aja Beech, F.J. Bergmann, Brenton Booth, Robert Cooperman, Joseph D'Agnese, Peter M. Gordon, Anne Graue, Bruce Harris, Ron Hayes, Matt Hohner, Paul Hostovsky, A.J, Huffman, Heidi Kraay, Jennifer Lagier, Elizabeth Lash, Johnny Longfellow, Sharon Lask Munson, John David Muth, Roger Netzer, Lisa Olsson, David S. Pointer, Charles Rammelkamp, William G. Rector, Vera Salter, Nancy Scott, Sarah Stockton, Sara J. Tantlinger, Catherine Wald, Phyllis Wax, Dennis Weiser, Matthew Wilson, Mike Wilson, Scott Wozniak. Collects our third year of fifty-two poems. Featuring Austin Alexis, F.J. Bergmann, Tom Brzezina, Stevie Cenko, Ann Clark, Louie Clay, Randall Compton, Robert Cooperman, Dalton Day, Kristina England, Matt Forrest Esenwine, Peter M. Gordon, Amy Holman, Paul Hostovsky, Scott T. Hutchison, Rosemarie Keenan, Elizabeth Lash, Linda Lerner, Lauren McBride, Catfish McDaris, Rachel Lynn McGuire, Tim McLafferty, Wilda Morris, Sarah Nichols, Steve Peacock, Joseph S. Pete, David S. Pointer, Charles Rammelkamp, William G. Rector, Linda Rodriguez, Mehnaz Sahibzada, Seamus Scanlon, Nancy Scott, Kathleen Shaw, Toby Speed, Allen Stein, Sasha Swarup-Deuser, Terry Trowbridge, Ken Tufford, H.B. Ussach, Catherine Wald, Tiffany Washington, Kayla Wheeler, Angel Zapata. Collects our second year of fifty-two poems. Featuring Elisa Albo, Christine Aletti, William J. Anderson, Nigel Bird, Alan Catlin, Joseph James Cawein, Robert Cooperman, JD Debris, Jeffrey DeLotto, George Dila, Doug Draime, Thomas J. Erickson, Matt Forrest Esenwine, Peter M. Gordon, Anne Graue, Michelle Holmes, Steve Hood, Paul Hostovsky, Jerry House, Monty Jones, Tonia Kalouria, J. Rodney Karr, Heidi Kraay, Mabel Lee, J. Patrick Lewis, Bradley McIlwain, Casey Zella Moir, Alison Morse, P.M. Pearce, Josefine Petersen, David S. Pointer, Amy Pollard, Charles Rammelkamp, Anina Robb, Stephen D. Rogers, Ruth Sabath Rosenthal, Nancy Scott, Nicole C. Scott, Pete Simonelli, Kimberlee Smith, Sarah Stockton, Peter Swanson, Kim Welliver, Max West, Aig'ner Wilson, Matthew Wilson, Angel Zapata. 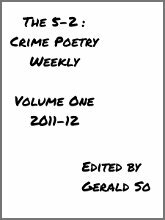 Collects our first year of fifty-two poems. Featuring Nyla Alisia, R.A. Allen, Margaret Anderson, Michael A. Arnzen, Randall Avilez, Jack Bates, Alec Cizak, Robert Cooperman, Ray Daniel, Michael Chacko Daniels, Cassandra de Alba, C.J. Edwards, John M. Floyd, Kent Gowran, Bruce Harris, Clarinda Harriss, Chad Haskins, Kathleen Hellen, Kyle Hemmings, Paul Hostovsky, Peter Ivey, Dorothy James, Tonia Kalouria, Susan Kelley, Ian Khadan, Rauan Klassnik, Lola Koundakjian, Dennis Mahagin, Catfish McDaris, Trevor Nelson, Brett Peruzzi, Thomas Pluck, David S. Pointer, Kimberly Poitevin, William Dylan Powell, Charles Rammelkamp, Keith Rawson, Stephen D. Rogers, Nancy Scott, Jackie Sheeler, Hal Sirowitz, Duane Spurlock, Jay Stringer, and Ray Succre. The Lineup #4 (2011) | What's the buzz? Print $7.00 from Lulu.com, or purchase signed copies from Murder By the Book (Houston, TX), Once Upon a Crime (Minneapolis, MN), The Mysterious Bookshop (New York, NY). Library Availability: Library of Congress (Washington DC), The Turtle Lake (Wisconsin) Public Library. The Lineup #3 (2010) | What's the buzz? Print $7.00 from Lulu.com. Also sold at Murder By the Book (Houston, TX), Once Upon a Crime (Minneapolis, MN), The Mysterious Bookshop (New York, NY). Note: Sarah Cortez and Carrie McGath opted not to have their work reprinted in the Lineup #3 ebook. 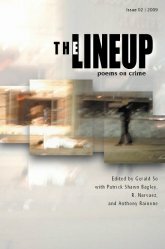 The Lineup #2 (2009) | What's the buzz? Print $6.00 from Lulu.com. Also sold at Murder By the Book (Houston, TX), Once Upon a Crime (Minneapolis, MN), The Mysterious Bookshop (New York, NY). 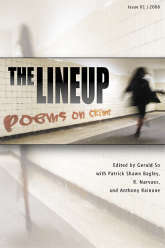 Note: The works of Sophie Hannah, Jennifer L. Knox, and Christopher Watkins that appear in the original print Lineup #2 were not reprinted in the ebook version as electronic reprint rights to these poems were not obtained. The Lineup #1 (2008) | What's the buzz? $6.50 from Lulu.com. Also sold at Murder By the Book (Houston, TX), Once Upon a Crime (Minneapolis, MN), The Mysterious Bookshop (New York, NY). 24 poems on love and chance formatted for an e-reader's screen- and font-resizing features. 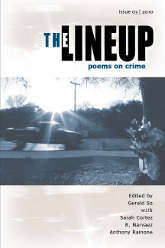 Includes work originally published in Long Island Quarterly, Barbaric Yawp, and Nerve Cowboy. Reviews: Jim Winter, Ron Scheer, Bill Crider.